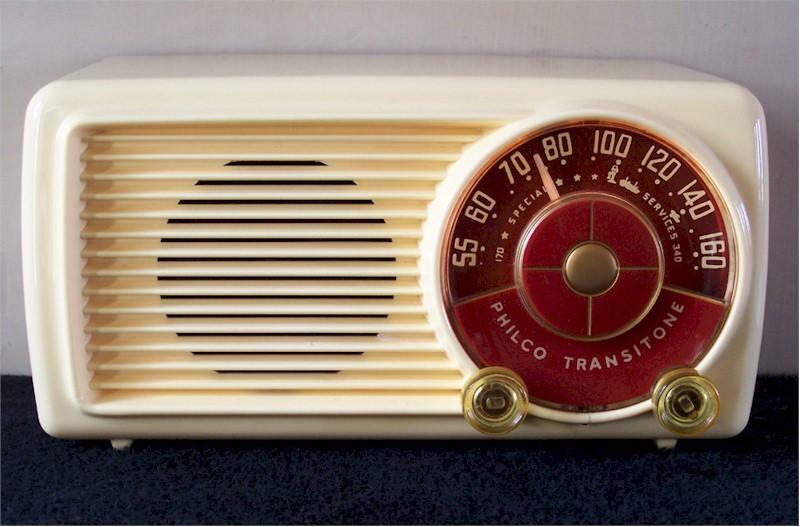 Every time I see this Philco I think of the movie Hoosiers and Dennis Hopper referencing, "On that little Philco over there," meaning the radio he listened to the basketball game on. Being from Indiana and loving basketball, what can I say? Here's another of those really stylized Philcos in a soft vanilla/ivory. The cabinet is not Bakelite, but rather, Polystyrene. Philco made quite a few radios from this material. Anyway, it looks and plays great! It has been tuned, aligned and electronically serviced. It's a real looker! The tube layout is in great shape on the bottom. A classic and a 10 on the Jim Dennis "Scale of Beauty!" If you'd like additional pics please let me know.